Speaking of Thanksgiving...usually we are open for business that night for all the Lawrence locals who need to escape their families. However, it depends on what our staff is doing and if someone wants to work. We'll keep you posted. If we never see another turkey again, we'll be happy. At least until next week. The Sandbar had a fairly uneventful Thanksgiving holiday. We were open Thursday night for those of you looking for a beer after dinner. In years past, we had a tradition of counting all the dollar bills on the wall, but somewhere along the way we got out of the habit. I have no idea how many dollars were on the wall at last count; probably in the thousands, but who knows. The only semi-interesting thing that seemed to occur was the ghost's harassment of Joe. He claims that the ghost kept throwing the trash can down the stairs to the basement. Could be. But the trash can's home is also a precarious perch, and it's sometimes difficult to get it set properly without sending it tumbling down the stairs. The holiday season is now officially upon us. If you or your friends or your coworkers are interested in having a Christmas, graduation, or other type of party at The Sandbar, let us know. We don't do private parties or rentals, and of course we're limited to small numbers because of pesky fire codes, but we're happy to entertain. Just give us a call. The Sandbar will be open on Thanksgiving. I think the only day of the year we're completely closed is Christmas Eve. Holidays like Thanksgiving and Christmas often can be quite busy with displaced Lawrencians back in town for a visit. After all the food and family, sometimes you just need a bit of a break. And a beer. Coleen will be tending bar and Andrew will be at the door. They'll probably be open around 8 p.m., so come on out for some holiday cheer. Tell us what you're thankful for in the comments. 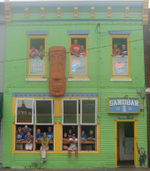 The staff at The Sandbar hopes you all have a fun and safe holiday. Don't eat too much turkey. For those of you who are looking for an excuse to get away from the family, we will be open later this evening. I can't tell you what time because it depends on what time Coleen decides to get there and open. We're kind of flexible like that on Thanksgiving. Stop by for a drink later!